I feel like today’s my “Deep Thoughts by Jack Handy” day (if you remember that from SNL..I loved those!) I’m watching a GIANT thunder storm pass through New York City right now. It started out as a drizzle, then the wind picked up. I was a 1/2 hour into a PT session and my client screamed, “WHOA!” (a la Joey from Blossom) and I looked out the window… it was HAIL! Now earlier in the day I had posted to my Facebook wall, “I think I’m melting…no joke!” It was 100 degrees and unbareably HOT. Why am I sharing this seemingly pointless weather observance on a site that’s tailored to fitness? I’ll answer that…look at the title of this post! Like with the storm it only takes a moment to change. One moment it’s sunny the next pouring…given a bit more time hail then like Little Orphan Annie sings, the sun will come out tomorrow. Sometimes it can feel more like a “Hard Knock Life”, but when we start to look at the big picture, our life is made up of many moments, some good some not so much, but it only takes one of those moments to change the way we think, feel or even look. Whether you’re in an amazing place or a bit down, it can change in a second. If it’s a physical change you want to make, it’s a thought, a commitment that needs to be made today to change the rest of your life going forward. One of my favorite sayings is, If you keep doing what you’ve always done, you’re gonna keep gettin’ what you’ve always got. If you’re unhappy…CHANGE IT! It’s only a moment. 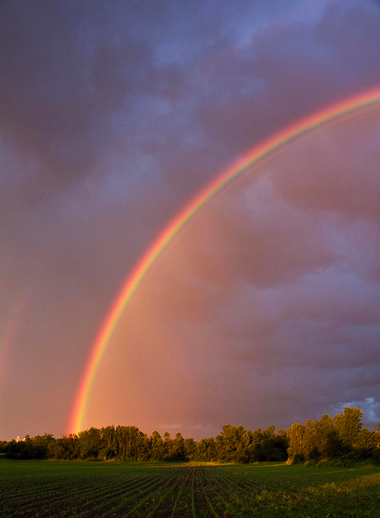 Today it may be raining, but with rain after the storm passes there’s a beautiful rainbow waiting behind the clouds. What will YOUR beautiful rainbow be and WHEN will you let it shine? Let your colors shine TODAY, My beautiful rainbows!!! I can see you GETTIN’ FIERCE!!! This entry was posted in FIERCE FUN, FIERCE SOUL, FIERCE- ISH and tagged free, love, moments, peace, rainbows by GETFIERCE TRAINING. Bookmark the permalink. I went to Vippasana 10 days meditation then I saw 360 degree rainbow ! The teaching was same the moment to moment changing our cell is dying a moment and creating new cell. We can change if we want to! Thank you for shearing !